HONG KONG—Leg 4 of the Volvo Ocean Race brought the Ocean 65 Class boats to Hong Kong last week, with local team Sun Hung Kai/Scallywag first into their home town port. 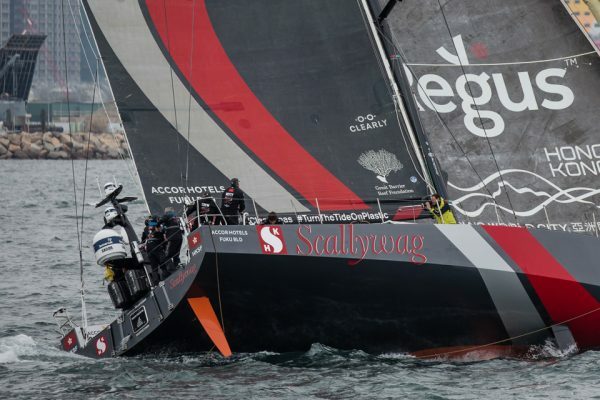 The David Witt skippered Scallywag is the first Hong Kong team to feature in the race’s 44 year history but the big question was, would they be able to build on their historic leg 4 (Melbourne to Hong Kong) win during the two header, Saturday and Sunday in-port races in Hong Kong. The Saturday race was an in harbour race and Sunday’s was around HK Island. Despite a great start on Saturday for the home team they struggled on a challenging afternoon on the waters of Kowloon Bay. In the end it was the Simeon Tienpont skippered team ‘AkzoNobel’ who won, with ‘Dongfeng Race Team’ finishing second ahead of ‘Team Brunel’ (3rd), ‘Team MAPFRE’ (4th) and ‘Scallywag’ only managing a disappointing 5th ahead of 6th placed ‘Turn the Tide on Plastic’ (Clean Seas). 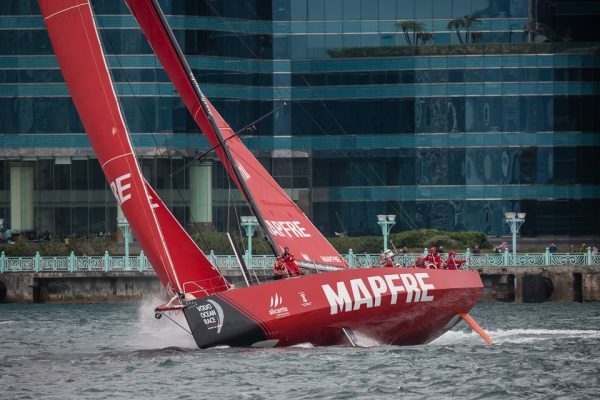 On Sunday, for the around the island race, again starting off Kai Tak watched by many people attending the Race Festival Park, ‘MAPFRE’ had a great start and continued strongly throughout the race to take 1st place followed closely by ‘Dongfeng’. ‘Scallywag’ edged ‘Team Brunel’ for 3rd place, ‘AkzoNobel’ finished 5th, followed by ‘Clean Seas’. Vestas team wss unable to race this weekend as their boat was in need of repairs that will also keep them out of today’s Leg 5 to Guangzhou. The results of in-port races do not contribute to the overall Ocean Race Scoreboard, they are allocated and recorded on a separate scoreboard and will only be taken into account should there be a tie in the Ocean Race result when it ends in The Hague in May. 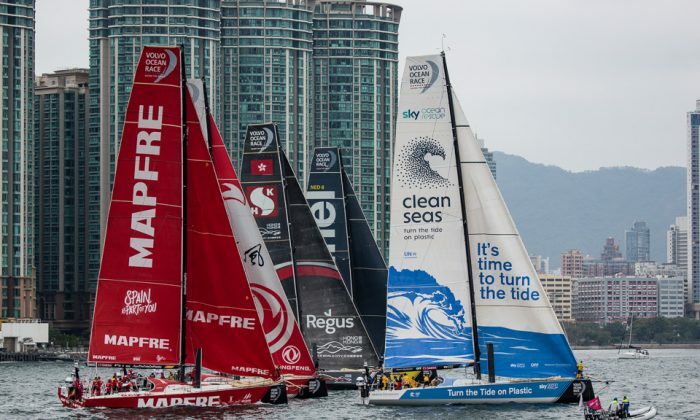 The Overall Ocean Race scoreboard is headed by ‘MAPFRE’ with 33 points, followed by ‘Dongfeng’ (29), ‘Vestas’ (23), ‘Scallywag’ (19), ‘Team Brunel’ (17), ‘AkzoNobel’ (14) and ‘Turn The Tide on Plastic’ (8). Leg 5, a short race (100Nm) to Guangzhou starts on Feb 1 and points earned will contribute to the main race series. ‘Dongfeng’ heads the in-port race standings but equal on points (25) with MAPFRE, Team Brunel is on 17, AkzoNobel is on 16, Vestas is currently on 12, Scallywag is on 9 and Clean Seas is in 7. 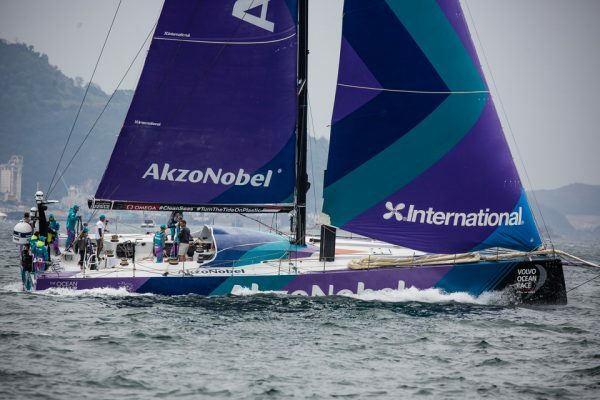 There will be an inport race while the boats are in Guangzhou, after which they will return to Hong Kong to prepare for the start of Leg 6 from Hong Kong to Auckland starting on Feb 7. Dan Marchant is a freelance writer and photographer in Hong Kong.